In a small bowl take some orange juice, lime juice and lemon juice, honey, salt and pepper. Whisk and keep aside. In another big bowl take all the other ingredients. Pour the lime mixture and toss a little. Take this in a serving dish, bit chilled topped with your favorite greens. 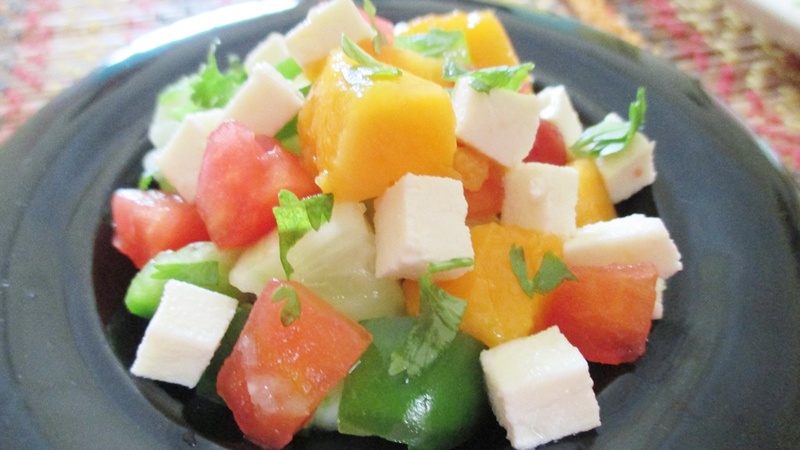 Enjoy a delicious colorful summer salad. Sutapa Ghosh is a food and motivational blogger. A food photographer too, loves to take yummy pictures of my dishes and share happy healthy thoughts with the world. For more such yummy delicious and healthy food, join her food blog Tips For Delicious And Healthy Cooking. This recipe looks pretty tasty.Many fruits and vegetables ‘contain’ vitamins and/or minerals (they are not ‘enriched’ in them). Also, evidence has shown that increasing the range of fruits and vegetables as well as the overall amount you consume, in addition to leading a healthy lifestyle will reduce your risk of developing many chronic diseases. So whilst tasty there’s nothing particularly special about mangoes.